Zoe vs. the Universe: Zoe vs. Sicily. Part I: Isola Bella, which means "beautiful island, OMG, these rocks are killing me and I have more boo-boos than anyone!" Zoe vs. Sicily. Part I: Isola Bella, which means "beautiful island, OMG, these rocks are killing me and I have more boo-boos than anyone!" Sorry, folks, I know it's been a while. I had a lot on my plate. For one thing we were away on vacation, and I'll be sharing a lot about Sicily in the coming weeks, starting with our visit to Isola Bella in Taormina. 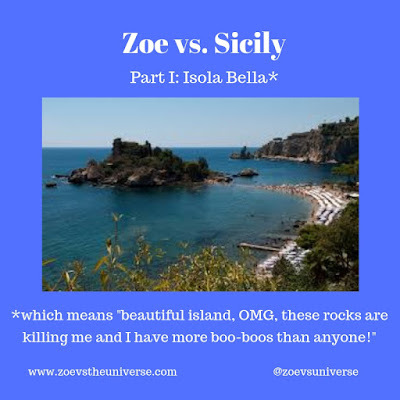 This was Zoe's first international trip, and in Sicily she discovered a beautiful, historically rich new world in which she could whine. When we came back we were busy with back-to-school things, and then I hurt my back, which I'll be sure to tell you about here as well so you can see where Zoe gets her whining prowess from. Plus, I was really busy at my day job. That's right, folks, this blog does not make me any money so I have to work. If that gives you the sads, I want you to right now go to your couches and search for loose change to send me. Just place your quarters and dimes in an envelope addressed to "That Crazy Blogger Lady" and drop it in the mail. The Postmistress knows me. So we went to Sicily this August, and we spent a few days on the east coast, in Taormina, and then a few days in Palermo, the capital, on the northwest coast. One of our first trips was to the beach at Isola Bella, which was simply stunning. Just like Zoe! Beautiful on the outside, treacherous on the inside! But also, yes, very rocky. In fact, we'd been warned that a lot of the beaches in Sicily were rocky and we should bring water shoes. Zoe had her water shoes but the rocks, in addition to being plentiful, were slippery so we kept falling down. I wanted to take her out to Isola Bella itself, aka the largest rock in the middle of the water. Check my thinking here, folks. First, it was there, which meant it must be stood upon. Second, when would we ever be here again? Seemed like a once-in-a-lifetime opportunity, so I wanted to go out there with my once-in-a-lifetime child. Making memories, right? We sure made them! The complaining kind. Zoe slipped and fell so much, and I did too, and we scratched our hands and arms and legs on all the rocks. By the time we got to the island she was in a Very Bad Mood and blamed me for Everything Bad That Had Ever Happened to Her. She was especially upset that she had more boo-boos than I did. She looked around briefly, then asked to go back. On our return trip I was instructed to fall and thus get more boo-boos than she had, this being one of the few challenges she did not want to win. I looked back at the rocky island and crossed it off my bucket list, my satisfaction tempered by my irritable companion. I think she really appreciated the view. Before. When she still took enough pleasure in life to dab. Beware of rocks! Click here to subscribe.